As a bipartisan effort at criminal justice reform gains traction at the federal level in the wake of the departure of US Attorney General Jeff Sessions, we must show gratitude to the nonprofits and public agencies across the country that kept reform efforts alive in practice during decades of increased mass imprisonment. This network of programs, working with various longstanding models showing proven success, provides a rich, informative knowledge base about how things work on the ground in various combinations. The study compared outcomes in the Bronx between a prototypical holistic defender’s office and a more traditional one using court data from more than 587,000 cases spanning 2000 through 2007 and 2012 through 2014. The research, by the nonprofit RAND Corporation and the University of Pennsylvania Law School, found that defendants offered holistic services were about 16 percent less likely to get locked up. They were also expected to serve 24 percent shorter jail and prison sentences—without leading to any increase in crime. In drug cases, those represented holistically saw their likelihood of serving time decrease by 25 percent; expected sentence lengths were reduced by 63 percent. Over 10 years, defendants under the holistic model spent 1.1 million fewer days behind bars. About 4,500 people who otherwise would have gone to jail avoided it completely. The study took advantage of a natural experiment occurring in Bronx courtrooms every day. The Legal Aid Society, one of the oldest (founded in 1876) and largest traditional public defender’s offices in the United States, and the Bronx Defenders, a holistic start-up formed in 1997, divide between them the 95 percent of defendants in the borough who can’t afford a lawyer. They are randomly assigned the cases, ensuring an essentially pure comparison despite the many confounding variables of the criminal justice system. The main point of holistic defense is that its practitioners see defendants as people with complicated histories and lives that don’t stop because of an arrest. 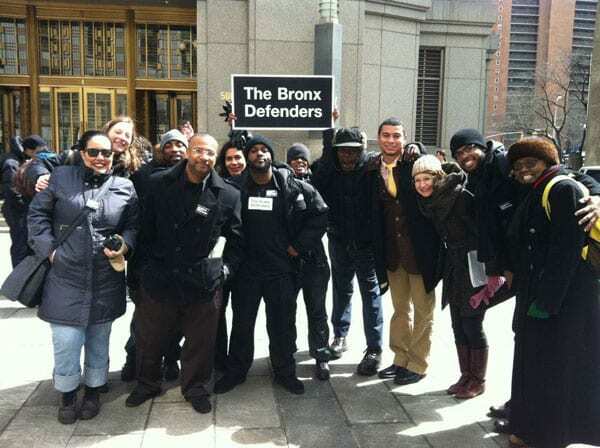 As practiced by the Bronx Defenders, who pioneered it in the late 1990s, each client gets a team of lawyers, social workers, and other advocates to help address the reasons a client ended up in court in the first place. The Defenders’ website lists 11 types of legal or administrative representation they might provide, from criminal defense or family attorneys to community organizers and social workers. This type of intervention is naturally more expensive in the short term than traditional defense work, and though many other programs strive to be holistic, the Bronx Defenders acknowledge that their efforts benefit from their geography. Not every jurisdiction in America can afford—or has the political will to provide—this caliber of legal services to poor people. (Arkansas’s entire 2008 indigent defense budget was $200,000 less than Bronx Defenders’ 2015 grants.) Many public defender’s offices claim to be “holistic,” as it’s become something of a buzzword, but few have the staffing and training to back it up. In rural areas, social workers, drug treatment providers, and mental health services are few and far between, let alone high-quality lawyers. Moreover, the kind of intensive, time-consuming attention to each case that the Bronx Defenders offer their clients isn’t acceptable to many judges outside New York City, where the priority is moving dockets along. The reduced costs of incarceration and recidivism do more than pay for the increased cost of the program, but it’s a political task to make that argument effectively. The criminal justice system as it stands is stacked firmly against communities of color. It would take a systemic overhaul to address the issues BD team members help clients navigate, like immigration and housing barriers, and that might mean restorative justice practices and the decriminalization of poverty. Until then, BD’s work doesn’t only help defendants stay out of jail and qualify for public aid; it forces the courts with which it interacts to recognize how criminal justice proceedings can dehumanize people. The difficulty and expense involved with putting together a case in a holistic manner should itself demonstrate a need for deeper change. Unfortunately, the cost associated with the program is a barrier to scaling it. According to Oliver Laughland at the Guardian, “up-to-date figures are scant,” but from 2002 to 2008, according to a study from the American Bar Association, total “US Indigent Defense Spending” increased almost 35 percent, to about $5.3 billion. Despite this, public legal representation is chronically underfunded, and where government is responsible for the budget, shortfalls are sure to exist. Court systems striving for efficiency under a crushing workload have led to a staggeringly high percentage of clients who plead guilty in order to get shorter sentences, and public attorneys who spend only minutes, if that, with each client.Nevertheless, holistic defense is spreading. The Legal Aid Society, New York’s other major public defender’s office, says that they are moving toward that model, though they didn’t have the advantage of being a nimble startup when the model came on the scene. “The takeaway of this report is to say that fully funded [defenders], lower caseloads, the ability to have trained, supervised staff that have experience and that are client-forward and innovative is what you need,” said Tina Luongo, attorney-in-charge of criminal defense at The Legal Aid Society. “And I don’t care what you call it…that’s what we do.” The American Bar Association has shared holistic defense guidelines for their members. And founder Robin Steinberg has moved to Oklahoma and started another organization in Tulsa called Still She Rises to implement holistic defense for incarcerated mothers. In Louisiana, a state bill seeks to increase funding for public defenders, but only by cutting support for the nonprofits who support public defenders in their work. The amount at play? A paltry $1.7 million.